Calculus, also known as tartar, starts out as soft dental plaque. This soft material can be found along the gum-line and is often mistaken for food particles, but is actually mostly a mass of bacteria. Dental plaque can be easily removed by regular brushing and flossing. 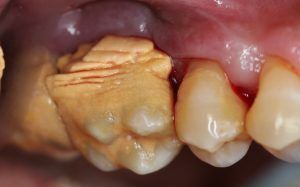 However, if not removed, it can take in minerals like calcium and harden on the tooth. At this stage it’s unlikely regular tooth brushing will remove it. The rate of calculus formation depends on many factors and varies from person to person. However, brushing and flossing twice a day, drinking water after meals, and limiting intake of sugary drinks and snacks, can help prevent it from forming. We recommend brushing with a soft tooth brush and toothpaste approved by the ADA (a small box with “ADA” on the packaging will indicate the product has been approved). The photo below shows the lower teeth on the side facing the tongue. On the left, the teeth and gums have been professionally cleaned. Notice the whiter color and less “blocky” look compared to the photo on the right. Calculus and plaque cover the teeth on the right. Unfortunately, it can be difficult to tell if you have calculus unless you have a severe case, like the one pictured below. No amount of calculus is healthy and it’s helpful to get routine check-ups to make sure it is removed before damage is done to the supporting gums and jaw bone. At your appointment, your dentist or hygienist will explain how to best remove any calculus build-up you have.